Meet in Italy for Life Sciences 2018' is the most important international event in Life Sciences, and includes networking activities, thematic workshops and a conference on the relationship between Big Data and modern medicine. 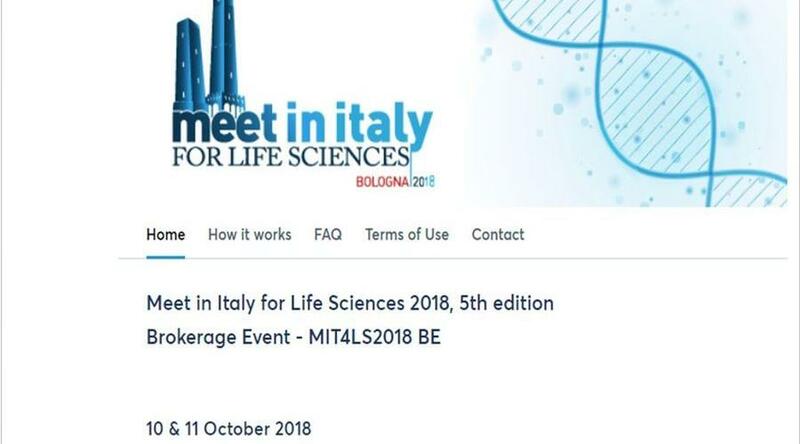 'Meet in Italy for Life Sciences 2018' will be held in Bologne (Italy) 10-11 October 2018. A key element of the meeting is the brokerage event being organised by Enterprise Europe Network. Greek participation will be supported by the National Documentation Centre (EKT), co-ordinator of Enterprise Europe Network-Hellas, the Greek node of the European network. The most important international event in Life Sciences will include networking activities, thematic workshops and a conference on the relationship between Big Data and modern medicine. Greek participants will have the chance to discover innovative technologies and products, present research results and take part in business, technological and research collaboration,making contacts from within a large community of companies, research laboratories, university clinics, health centres, investors, regional bodies and professional associations, clusters, technological parks and incubators and policy makers. 'Italian Healthcare Venture Forum Bootcamp 2018' 10-11 October. The forum is dedicated to innovative start-ups and will feature a mentorship programme and pitching sessions with investors. Thematic workshops 10-11 October. Meetings that will explore specific topics in depth and include discussions with international players. Registration is open until 03 October 2018. For further information on participation and registration contact the National Documentation Centre (Dr Cristina Pascual, tel: 210 7273920, email; cpascual@ekt.gr).